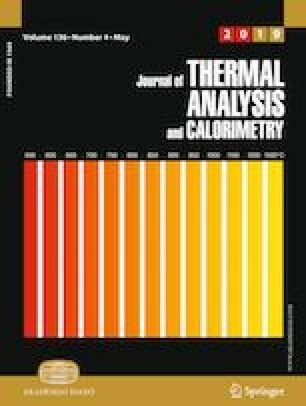 This paper presents the thermal behavior of Co, Ni and Fe succinates obtained by sol-gel synthesis using Co(II), Ni(II) and Fe(III) nitrates, 1,4-butanediol and tetraethyl orthosilicate as reactants. The thermal analysis revealed the formation of succinates at 413–453 K and their decomposition to ferrites at 503–623 K. The rate constants for the decomposition of succinates to ferrites, calculated using the isotherms at 473, 523, 573 and 623 K, were used to determine the activation energy of each ferrite (NiFe2O4, Ni0.3Co0.7Fe2O4, Ni0.7Co0.3Fe2O4 and CoFe2O4) embedded in the silica matrix. By increasing the Ni content in the mixed Ni–Co ferrites, the activation energy decreases from 13.530 to 1.944 kJ mol−1. The formation and decomposition of succinate precursors and the formation of silica matrix were confirmed by FT-IR spectroscopy, while the formation of CoFe2O4 and NiFe2O4 single-phases embedded in the silica matrix was confirmed by X-ray diffraction analysis. The nanocrystallites size decreases from 31.7 (CoFe2O4) to 18.5 nm (NiFe2O4). The optical band gap of mixed Co–Ni ferrites was significantly higher than that corresponding to CoFe2O4. The photocatalytic activity of the samples was evaluated against Rhodamine B under visible light. All the samples have photocatalytic activities, the best performance being obtained in the case of Ni0.7Co0.3Fe2O4.